***Our family was invited, as guests, to sample the new Limited Time menu selections at an Arby's near us. No further compensation was provided. All photos are copyright Momma Told Me Blog 2013. Momma Told Me: Seasons come and go, but good food is always in style. When I was younger fast food was always considered a treat. Not that Momma's cooking wasn't good, but there was something about a freshly seasoned fry, and a paper wrapped sandwich that simply put me in a good mood. Our hometown has no shortage of fast service restaurants, with 8 different chains just off our street, alone. But there was always one that we had to make a 'special' trip for. One town over, right next to the mall, was a little hole in the wall Arby's. At first I only cared for the Jamocha shakes, a thick and creamy blend of chocolate swirl and coffee infused ice cream. Every month or so my father would get a hankering for their world famous roast beef sandwiches, and sure enough, we'd make the 30 minute drive to indulge in a little Good Mood Food dinner. I recall, for our small 3 person family, alone, we'd walk out with 10 or more Roast Beef, and Beef N' Cheddar Arby's sandwiches- Pop would quite literally live off them for a week. As I got older, and began to eat foods outside my usual comfort zone, I turned to my father for culinary inspiration. Anything he like to eat, I would give a proper chance. I had always dipped my curly fries in their signature zesty Arby's Sauce (in fact, Momma even used to buy it by the bottle, back when it was sold that way in stores), but had never cared to try their signature roast beef sandwiches. Needless to say, it was love at first bite. There was nothing else like it at any other fast food restaurant, and I was hooked. Just one bite of that oven-roasted beef, piled high beneath a sot sesame seed bun, bright red Arby's sauce spilling down the sides, I knew we'd be best mates for life. Really, it's not everyday I plug a fast food establishment; so, for those unfamiliar with this chain, hunt it down! Arby's has some truly original classics and a wonderful Value Menu for any budget, but they also offer some Select options that cater to seasonal palettes and local tastes. In addition to their wildly popular, and Deli Shop quality authentic Reuben and Ultimate Angus sandwich selections, Arby's has added a Market Fresh range to their menu. This collection of seasonal inspired menu selections is the brand's answer to a more health conscious and epicurean customer. With a slightly higher price point then the brand's typical premium sandwiches, options such as the Roast Turkey Ranch and Bacon or Roast Turkey and Swiss offer a classic true deli experience leaps above the modern 'value' sub shop. As a big fan of the chain I've been on their product development survey list for about a year and receive bi-weekly survey links featuring top secret upcoming product ideas. I love having a chance to provide valuable feedback to shape the chain's 'next big thing,' and think it's great that Arby's utilizes its consumers to make such big branding decisions. Recently thousands of fans voted wholeheartedly 'yes' for King's Hawaiian bun sandwiches, and this Summer a new seasonal Market Fresh Sandwich was also introduced; the Pecan Chicken Salad Sandwich. When paired with Arby's new Limited Time House Made Chips and Triple Berry Shake, the Pecan Chicken Salad Sandwich (available on honey wheat bread, or in a whole grain wrap) is the perfect light fare for a lazy Summer afternoon. Our family recently had a chance to visit our local establishment, as guests, to try the new menu selections. I'll admit, this was not the Arby's fare I grew up with, but I was excited to try the new menu innovations and explore unique flavors I would never find at the local McDonald's or Burger King. The other half was a bit unsuspecting as he took his first bite into that Pecan Chicken Salad Wrap full of grilled chicken chunks, crunchy pecans, diced red apples, crisp celery, juicy red grapes, mayonnaise and green leaf lettuce. While he ate the entire wrap, there were several comments about the unique selection of fresh fruit and veggies contained within. In the wrap, I found it quite refreshing; though there seemed to be a little too much sweet fruit for my tastes (I'd prefer the grapes left out and the crunch of the celery and apples to care the fresh flavors). 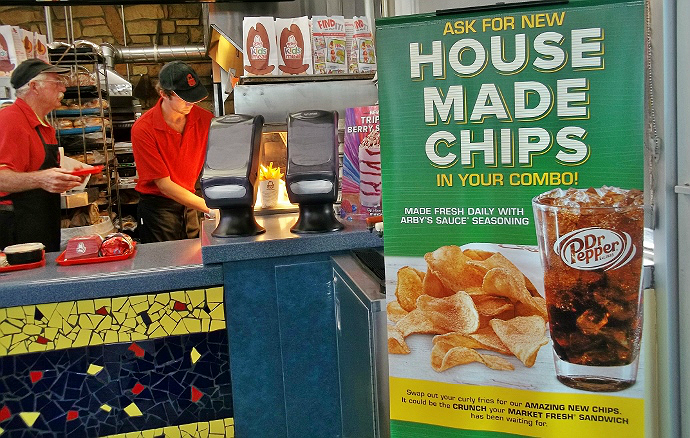 Also included in our culinary exploration were the brand's Limited Time House Made Chips, cut thick Kettle style and tossed in authentic Arby's Sauce seasoning. These truly proved too be the perfect compliment to the Market fresh range, offering an authentic deli feel with plenty of seasoned flavor to balance out the light Pecan Chicken Salad Wrap. Sabrina (10) had to get used to the thicker 'Kettle' style chips, but really enjoyed the flavor of the thick coat seasoning. 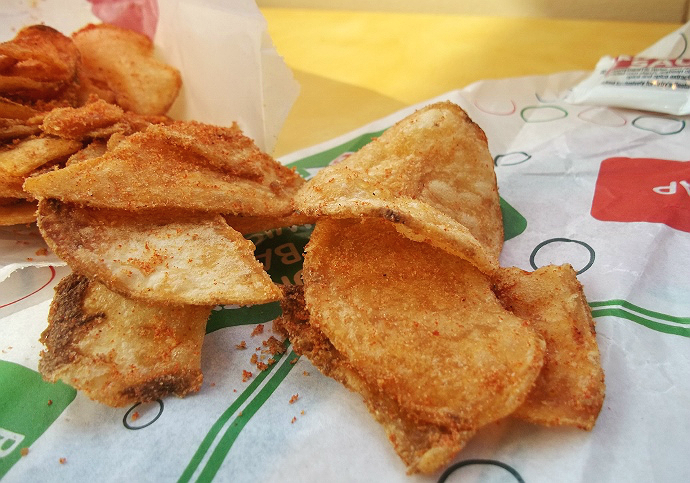 I thought it was especially neat to see the artisan style crisps of varying sizes, which gave the meal a more handmade and personal feel. Naturally we wrapped with the latest of the brand's famous shakes; the Triple Berry Shake, names so for its harmonious blend of tart raspberries, and sweet strawberries and blueberries. Topped with a fluffy mound of whipped cream, and decorated with a Berry Syrup swirl, this was clearly the showman of our meal. 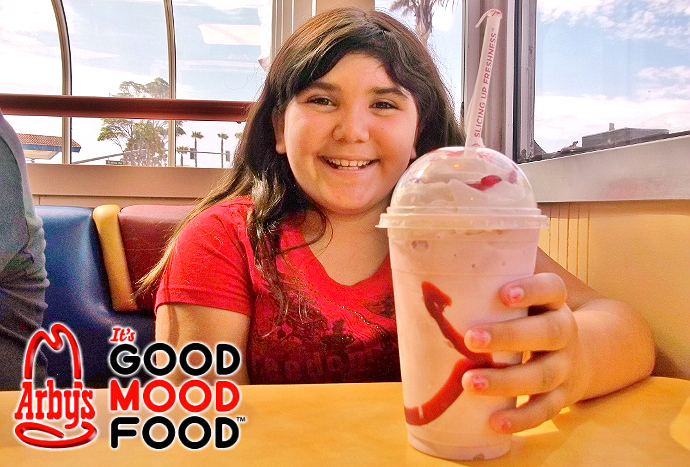 The smiles don't lie, the new Arby's Limited Time Summer selections were a big hit, and certainly the perfect example of why this chain is known for it's Good Mood Food. I loved the thick and extra creamy texture of the Triple Berry Shake and how it balanced the zesty Arby's flavor of the House Made Chips, and the light, yet largely portioned main course of the Pecan Chicken Salad Sandwich. 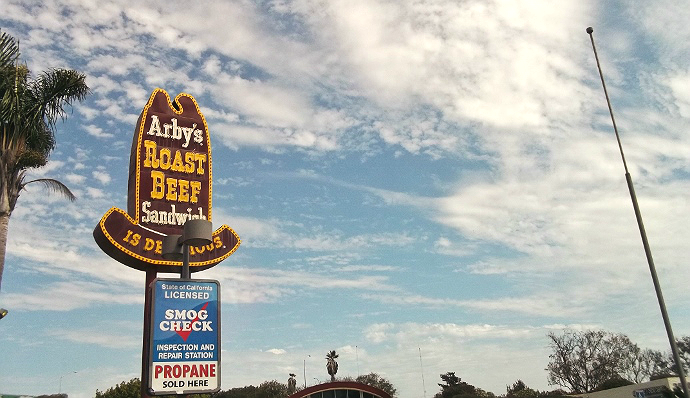 While I wouldn't order these items year round, and they haven't replaced my favorite Arby's Roast Beef sandwich, they are the perfect mid-week indulgence for this Southern California beach-town native. I can't wait to see what the chain will roll out next and have already been asked when we're going back! 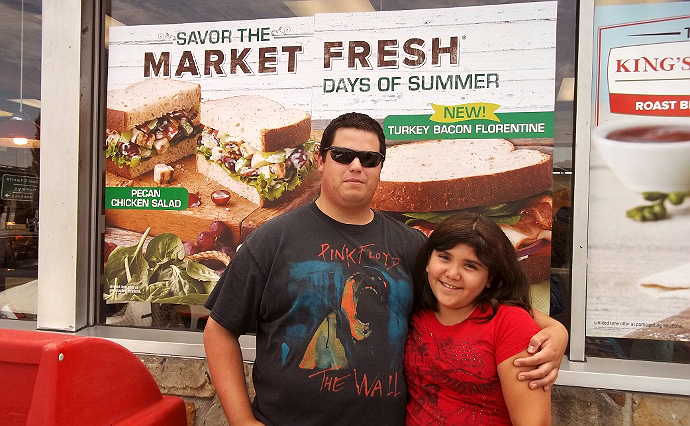 What Daughter Says: Arby's is always innovating fresh and inspired selections for their menu, and I love exploring them! One Momma Told Me reader will win 3 Pecan Chicken Salad Sandwich (or Wrap), 3 House Made Chips, and 2 Triple Berry Shake vouchers! The first thing I'd try are the House Made Chips:! I want to try the Pecan Chicken sandwich on Honey Wheat bread sounds great to me.. I'd like to try the mighty minis turkey-crispy onion . the housemade chips...I had to take a second look at them! I would like to try the mighty minis turkey. I would like to try PECAN CHICKEN SALAD the most. 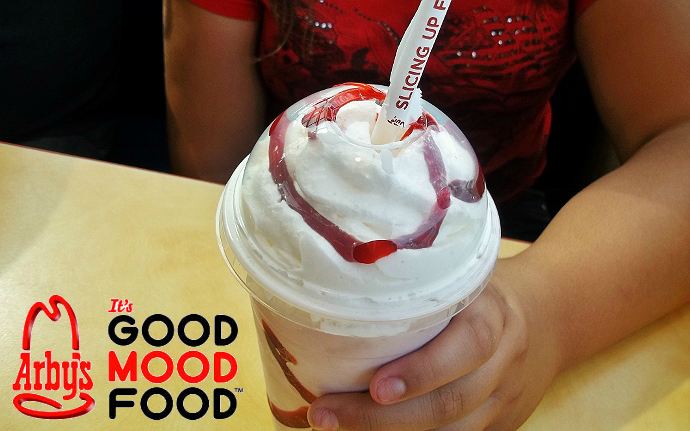 The Triple Berry Shake is a must try! The Spicy Santa Fe, I love spicy foods. I'd like to try the Spicy Santa Fe. We recently had the chips and they were really good! Love that first pic, it's been a while since I've seen one of those signs. I want to try the Pecan Chicken Salad Wrap. i don't think I can choose just one! 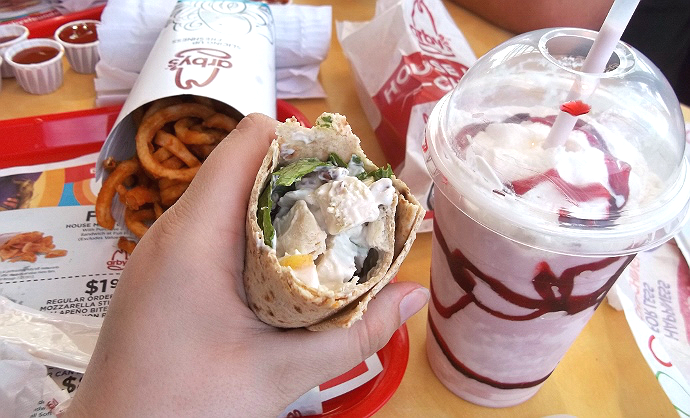 The Pecan Chicken Salad, the Triple Berry Shake and the House Made Chips. That triple berry shake looks amazing! Especially on a hot summer day! That Spicy Santa Fe sandwich looks good. man that wrap looks GOOD kid! ur making me hungry!! The Triple Berry Shake has my mouth watering...I love their chicken salad! Those Homemade chips (from your photos) is what I would most like to try! We no longer have an Arby's in our area. Love the sound of the wraps. Will have to look out when we are on the road. The spicy santa fe. I love spicy food. the mighty minis turkey with crispy onions, yum! The Pecan Chicken Salad would be my favorite, but I would also try the Spicy Santa Fe sandwich. 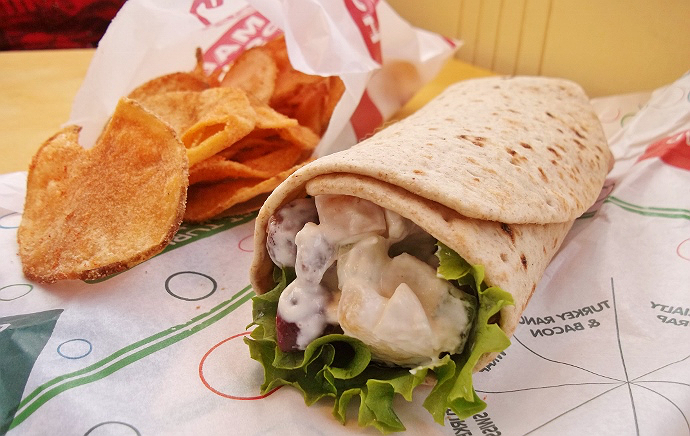 Pecan Chicken Salad Wrap, with the Housemade Chips. Their Pecan Chicken Salad looks so yummy....chicken salad is one of my favorites but rarely make it. I want to try the House Made Chips. Although they are Individually Quick Frozen and shipped to the stores, they do look like they would be tasty. I'd most like to try the Pecan Chicken Salad Sandwich. The housemade chips look awesome! I'd love to try those! I'd most like to try the crispy onion Mighty Minis™ Roast Beef. Thanks. The pecan chicken salad sandwich! 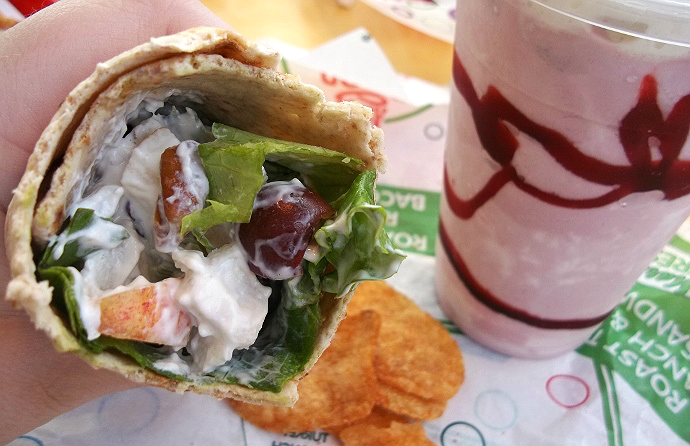 The Pecan Chicken Salad Wrap. The Housemade Chips sound amazing! !